First of all we need to choose the right color scheme of makeup that will blend in with the frame and the lens. If you love bright frames, it is necessary to refrain from saturated eye shadows, and emphasize the eyelashes. Pick a heavy mascara that lengthens your eyelashes and gives them volume, but do not get carried away because too long or false eyelashes can touch the lenses of the glasses, theglasses will get dirty and you will not be comfortable. If you give preference to classic frames made of metal, than the make-up should be calm without bright strokes. Delicate pastel shades will give your face freshness and lightness. If you choose horn-rimmed glasses, you need to take care of your eyebrows. They must be properly shaped, and the contour of the lips should be clearly drawn. 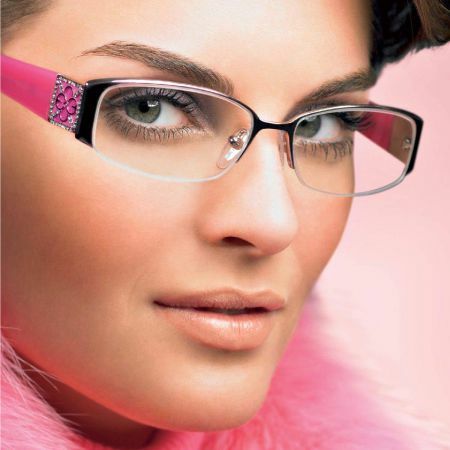 This kind of frame stands out on the face, so your face but not the eyeglasses frame should be highlighted. Thin silver and gold frames are the most popular. This option suits almost everyone. They are appropriate when you visit a completely different event, work and rest. If you prefer a silver frame, your makeup should be in cold tones, you can safely use gray, purple, silver eye shadows. Gold frames on the contrary require a warm makeup. It can be various shades of brown and beige. In addition to using the right color scheme, you need to consider how serious your vision problem is. Eyeglasses used for farsightedness make eyes visually bigger, and vice versa glasses for myopia reduced eyes. Therefore, you need to consider these features when doing your make-up. A little advice is: when choosing make-up, take a photo and check out how you look. The shortcomings or successful elements will be more visible on the photos. For make-up in case of farsightedness you should remember that it should be subtle, as it will appear brighter through the magnifying lenses of the glasses. If you cannot refrain from arrows, use liquid eyeliner and make a thin arrow. Do not use eye shadows with glitter or pearl because such make-up will look rather vulgarthrough magnifying glasses. Glasses with increasing diopter make the eyes more pronounced, and the excess mascara will only spoil the makeup, if it is possible, refrain from using mascara, but if you decide to still apply mascara, make only light strokes on the eyelashes. But the girls who wear glasses in case of myopia, on the contrary can safely use bright and juicy shades of eye shadow. The main task of makeup for glasses with myopia is to visually increase the eye. It is safe to use pearl and shiny eye shadows. The outer corner of the eyelids should be highlighted by eyeliner. And, of course, use mascara as eyes look smaller through glasses for myopia. Blush can also make your eyes more expressive. If you choose a shade of blush you should be guided by your own skin tone - they must be the same color. Apply blush at the point where the frame touches cheekbones and move toward the eyebrows. At first it will be difficult, so you need to apply blush with a brush touching evenly across the skin in one motion without pressure. Bright eyes promote the use of quieter lipstick shades. A bit of practice and you will be able to make a beautiful makeup that will emphasize your natural beauty. The main thing is to love yourself, because any dissatisfaction with appearance can be corrected by selecting the correct glasses and makeup technique. 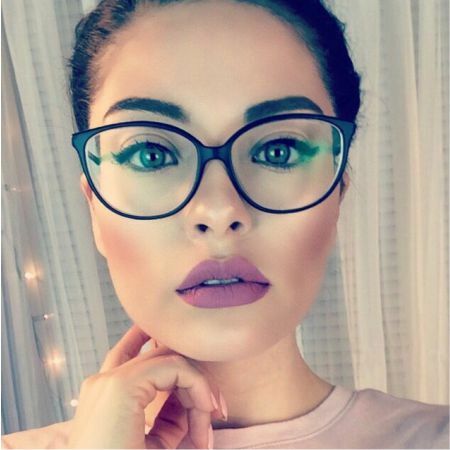 Like the article «Makeup Looks to Wear With Glasses»? Share it with friends!